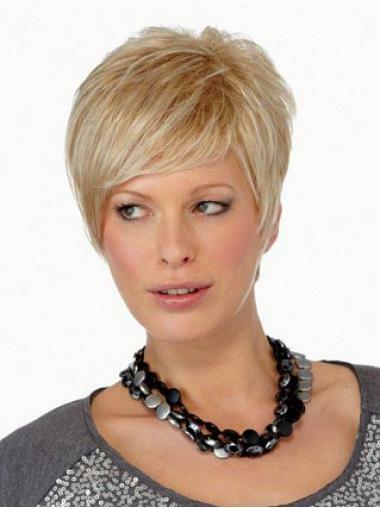 This is an elegant style Heat Friendly Synthetic Wig short wig with a voluminous crown, spiky, all-over layers and a subtle fringe. Beautiful, short, tapered layers make the Eva wig one of the easiest, most natural short wigs to wear.It's available in modern and classic colours. I have about 5 wigs now and this one is the best yet! I went a shade lighter and had the fringes trimmed. I wore to work yesterday and everyone just had a fit over it!! Amazing! Very cute. It’s a keeper for sure. I am going to order another one in different colour. This looks so natural and stays in place very well. I can also pull my hair back in a low pony tail while wearing this. The colour matched my hair perfectly. Right out of the box it is ready to wear. It is a cute, flirty wig with style. It is easy to brush and style, as well as to wash. It retains its shape so well. It stays in place and you cannot tell that I am wearing a wig at all. Beautiful wig!! The fact I can curl it with a curling iron is great. After having it styled it really looks very close to my natural style and colour. I will enjoy wearing it when I travel and just don't have the time to fuss with my own. I recieved this today and already have it on! This wig is gorgeous! very up to date and stylish.. not blunt . with whispy ends which makes it fabulously realistic! I wouldn't change a thing about this wig, so no heat for me even though you can use heat. 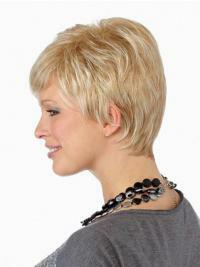 The back is a tapered layery look. I plan to order 2 more in different colours! NOTE .. if you don't have hair or have a small head this cap is on the larger end of average, it fits me very comfy. I love it!